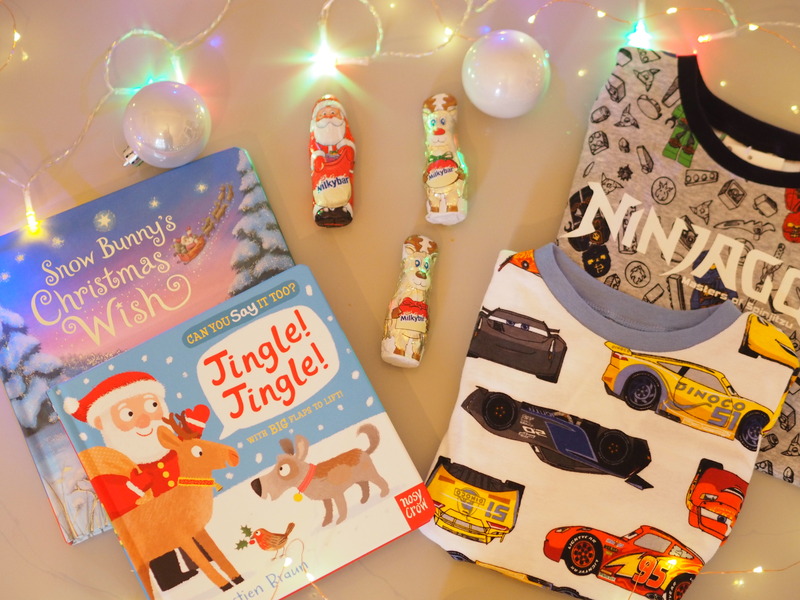 (AD) A Christmas shopping dash at Fforestfach Retail Parc … and what we bought! Does anyone else feel like Christmas shopping can be a bit overwhelming? I love it, don’t get me wrong – there’s nothing better than browsing the shops when it’s all festive – but I do feel the pressure at this time of year, and always run out of time to find something for everyone. So when Fforestfach Retail Parc asked us to take part in their Xmas Dash at Fforestfach challenge, it was perfect timing. I’ve started my shopping, but have a fair list of people to get through, so with a budget of £200, which was ever-so-kindly gifted to us for the challenge, we hopped in the car to go shopping. Fforestfach Retail Parc is just outside Swansea, and has four hours of free parking, which is so convenient. The shops include Homesense, Boots, River Island, H&M, New Look and DW, so you should easily be able to pick up something for everyone. Our Christmas shopping tactic is always to have a quick look in all the shops first, before committing to what we’re going to buy. We did our first round and realised pretty early on that we weren’t going to struggle … in fact, we were spoiled for choice! I’ll show you below what we ended up buying, and what we could have bought, but let me just start with a regret. I tried this amazing red coat on in River Island, and don’t know why I left it there 🙁 It’s perfect for this time of year … please don’t judge me if I end up going back for it! One of the best things about Christmas is the food, right? Of course it is! Traditionally, I always buy my father a load of foodie bits either for Christmas or his birthday (which is two days before Christmas), and this year will be no different. There’s a whole section of Homesense dedicated to food, specialist coffee, teas, sweet treats and even gin making sets. You could pick something up for any food or drink lover. There were some really nicely packaged products, including hot chocolate drops in Kilner style jars and the cutest Moomin jar of cocoa. 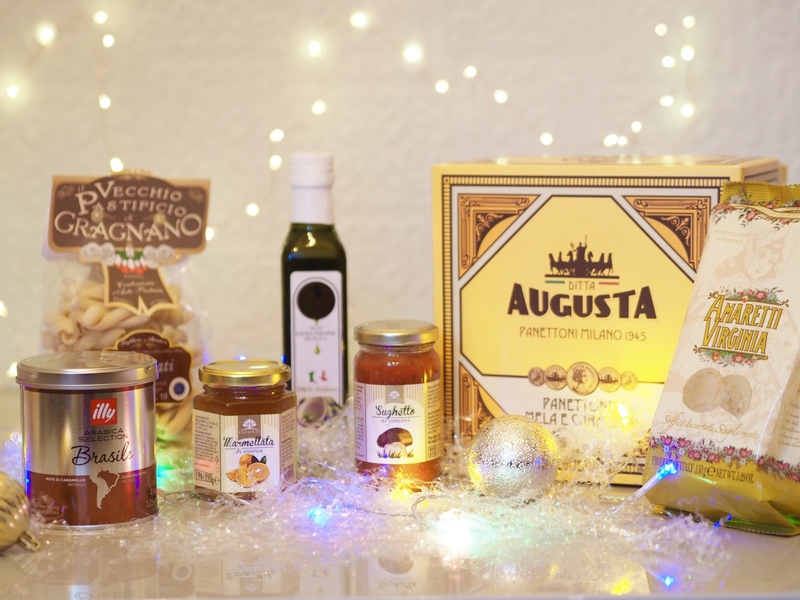 I chose a hamper filled with pasta, sauce, marmalade, amaretto biscuits, olive oil and coffee as a gift for my Italian food loving dad, as well as a panettone (Italian fruit cake) which can either be a Christmas or birthday cake. The poor thing always ends up with joint birthday and Christmas presents! As I mentioned above, you’re spoiled for choice when it comes to food and drink at Homesense. What I think is a really nice idea, is to combine a lasting gift with something the recipient can indulge in. So some nice wine glasses with a bottle of wine, or some pretty mugs with a tin of coffee or some fancy tea bags. It sounds pricey, but I discovered that New Look actually has a fab selection of homeware which is reasonably priced. I picked out some tile painted mugs, which I think are really eye-catching. They come in these pink and purple colours, as well as in black and mustard. 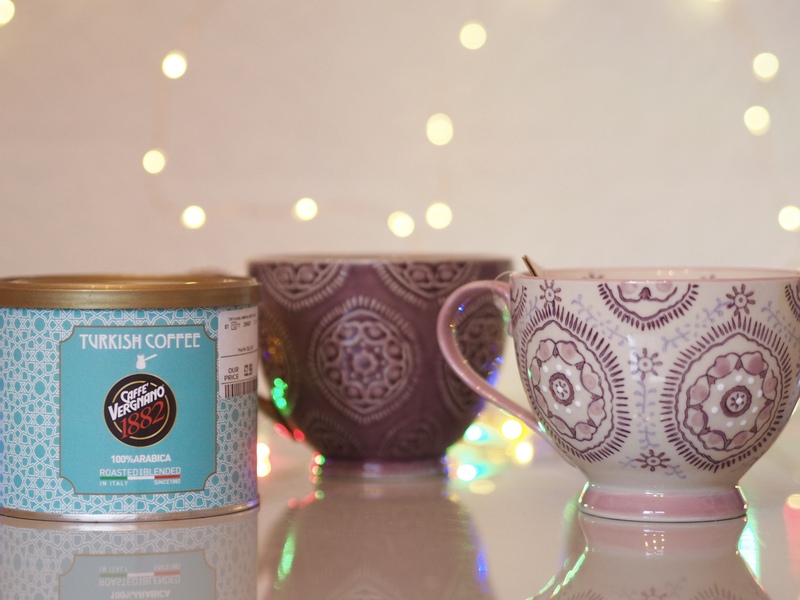 I’ll box them up with some unusual Turkish coffee to make the gift more personal. You could buy the decanter or glasses below with a gin-infusing set, for example. I have no idea where it’s come from, but gin is suddenly the most popular drink on earth! In the same way as the idea above, you could wrap up a nice bottle of flavoured gin with a couple of glasses or a cocktail set. 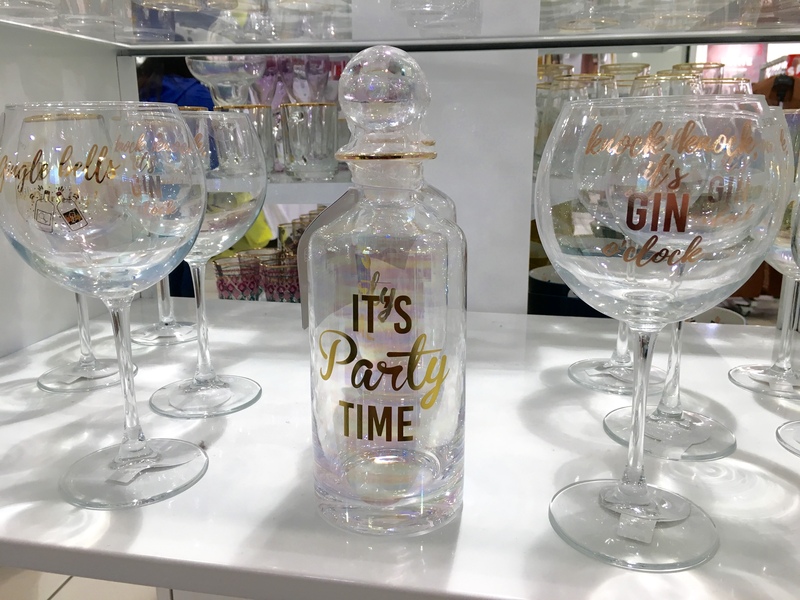 I spotted the decanter and glasses below in New Look, and they really caught my eye. The glass is iridescent and shimmers with pinks and purples as it catches the light. There was a gin infusing set at Homesense which would be the perfect accompaniment. It turns out that Homesense is the ideal place to go shopping for book lovers … I could have bought so many books for so many people (myself included). 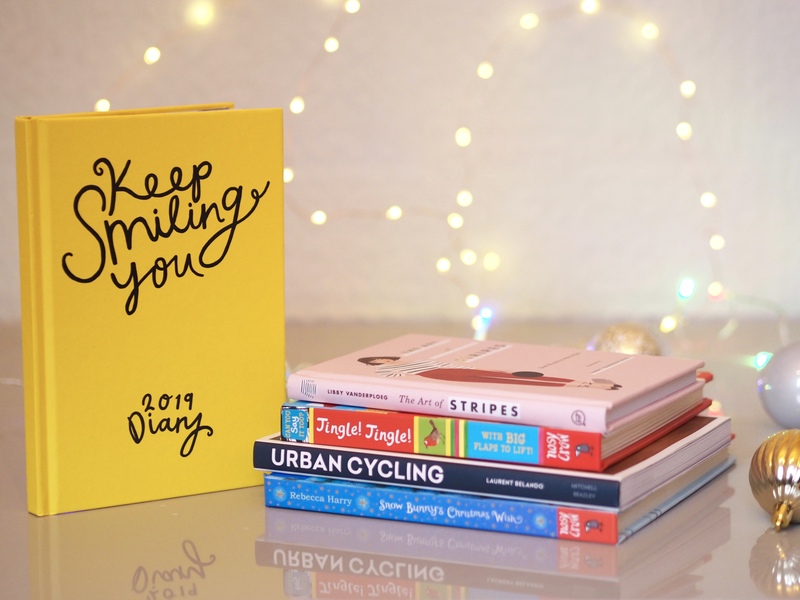 They have a fab range of quirky recipe books, fashion books, books about hobbies, as well as notebooks, journals and diaries. For notebook geeks like me, the range of Moleskines is amazing … lots of limited edition covers that I’m sure you can’t get elsewhere! There were also some of the Penguin classics with redesigned covers, which are a lovely collectors’ item. I limited myself to buying five books – yes, just five – and that was being very restrained! There are more books in the children’s section of the store too – a whole aisle of them, in fact! Box sets of Enid Blyton or Mr Men books would be a lovely gift, and there were a lot of non-fiction titles too. 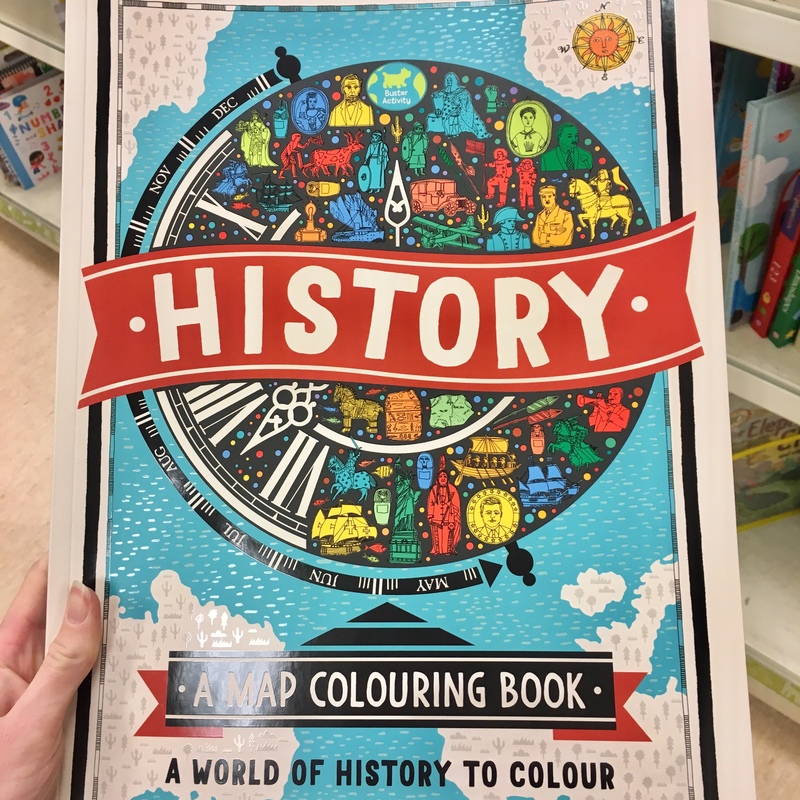 I loved this map colouring book. You might be able to tell that I like to put a few little gifts together to personalise what I buy people, and I’m really pleased with this duo. 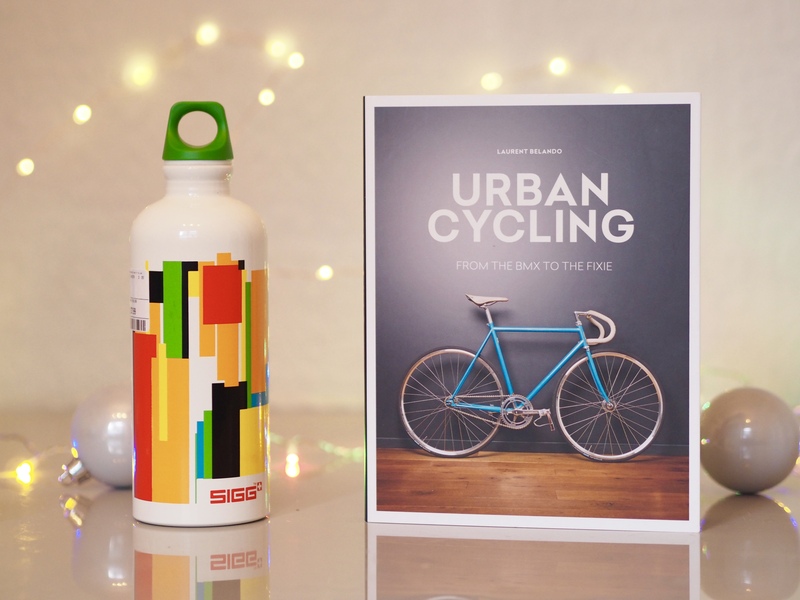 Urban Cycling is a lovely photo-heavy, glossy book featuring people around the world who love cycling. It didn’t seem like much on its own, so I’ve paired it with this retro looking Sigg drinks bottle. The Sigg design is iconic, and there’s something about it that reminds me of an 80s cycling jersey (I’m showing my age here!) and I couldn’t resist popping it in my basket. These usually cost around £17 for a plain colour, so was a bargain at £7.99. With there being no obvious children’s or toy shops at Fforestfach, I wasn’t sure if we’d pick up anything for our two boys. It turns out we could have bought a few things. 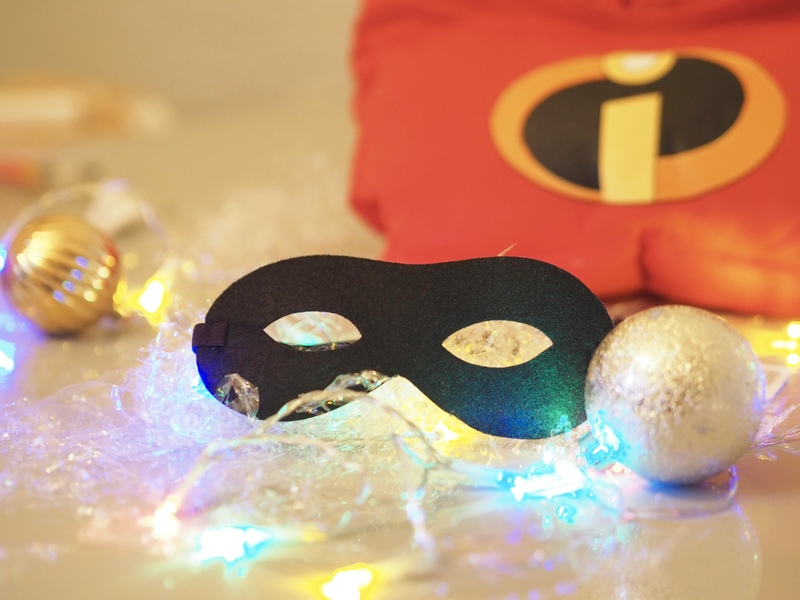 The most surprising was the section of dress-up costumes in H&M … who’d have thought it?! There were Spider-Man costumes, Batman, Paw Patrol and Superman, as well as WonderWoman, Bat Girl and princesses. Our eldest son has mentioned that he’d like an Incredibles costume, and I was so pleased to find one in his size in store. It’s an official Disney costume with the hilarious padded muscles superhero outfits have, and a black Incredibles mask. I can’t wait to see him wear it on Christmas Day. As we were heading to the till in Homesense, Stew (my husband) got really excited and started waving a box at me. He’d found a Harry Potter light painting wand which was reduced from £29.99 to £16.99. It’s not something we would have bought at full price, but as our eldest son is getting into Harry Potter, we didn’t mind paying nearly half price for it. 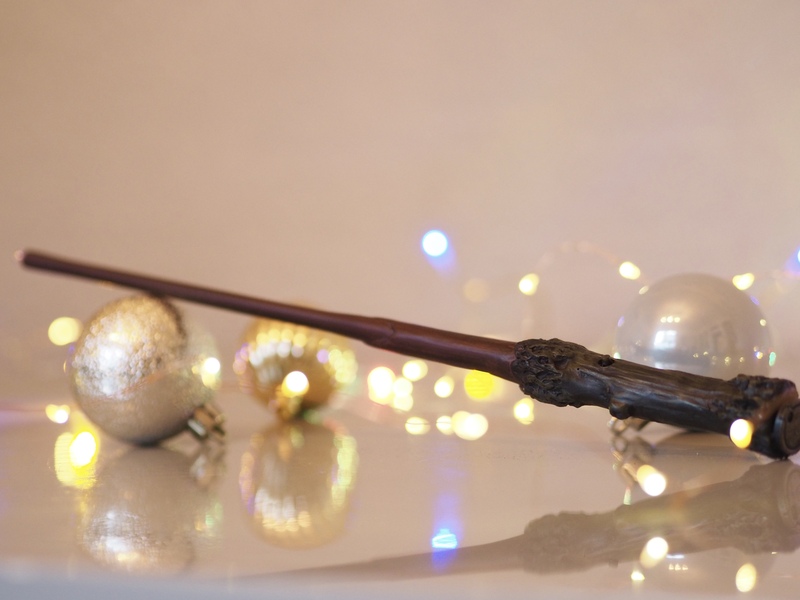 The wand interacts with an app, which captures the spells you cast onto your phone. I’m sure we’ll all be eating slugs for Christmas dinner (please say you get the Ron Weasley reference!). Hands up if you knew River Island stocked children’s clothes?! Not me! 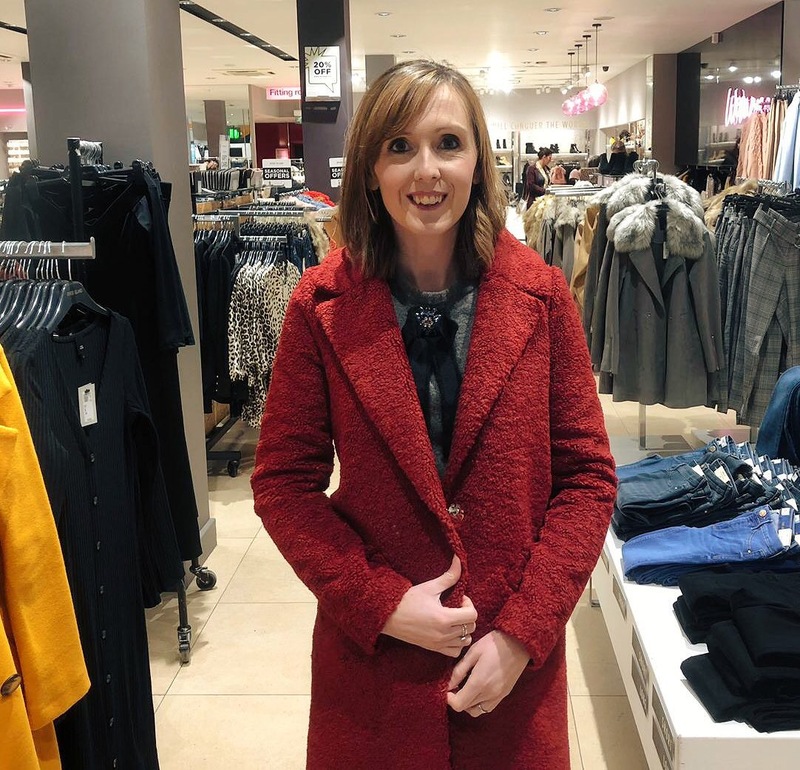 We ventured upstairs at the Fforestfach Retail Parc branch to check out the men’s clothes, and ended up in the mini section. I loved the boys’ accessories – bobble hats with HUGE pom poms, anyone? – and saw so many super cute girls’ outfits. 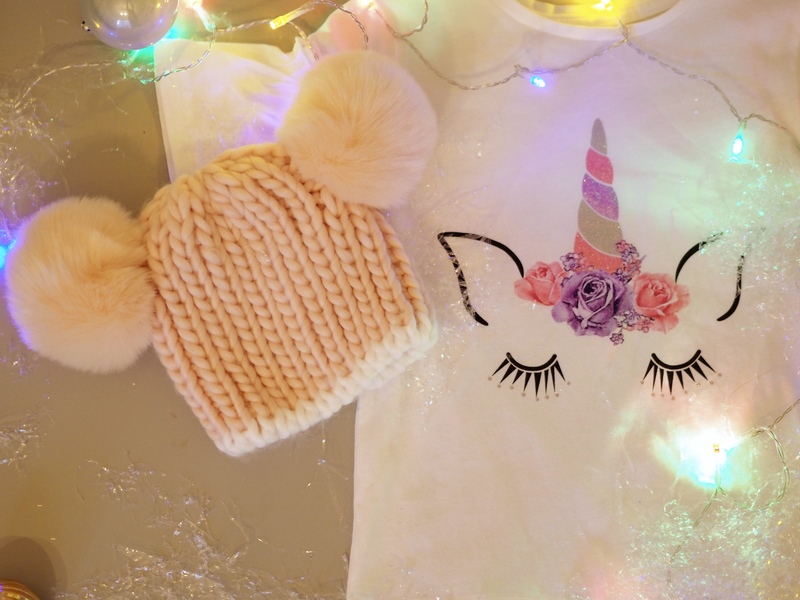 We have two nieces, so I took the opportunity to buy a glittery unicorn tee and pink hat . The tee has pretty fluted sleeves, and I think the double bobbled hat will look really sweet on. I couldn’t resist them! We all know and love the Boots 3 for 2 at Christmas, and Boots at Fforestfach has aisles and aisles dedicated to bath and beauty products on offer. All the usual ranges were there – Soap and Glory, No 7, Ted Baker etc – as well as newer brands like Zoella and the Little Mix make-up. I was tempted to choose some Benefit mini make-up products which were on offer at three for £25, but then saw the Clinique Christmas items which are boxed up like baubles. 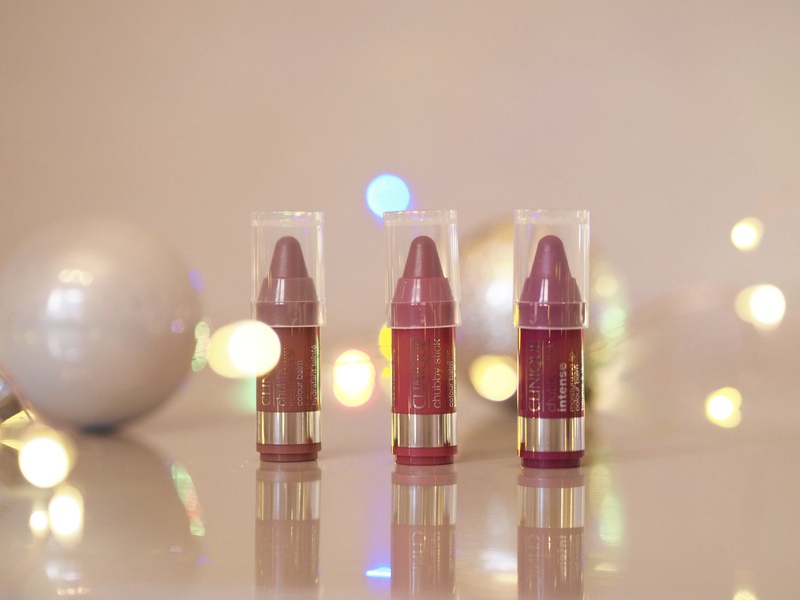 The Chubby Stick lipsticks are loaded with mango and shea butters plus Vitamin E, so they’re great for keeping your lips moisturised during the winter. This set includes the shades Graped-Up, Super Strawberry and Roundest Raspberry, for £15. Last, but not least, I started to get some bits together for our boys’ Christmas Eve boxes. I’ve never done them before, as I think they’ve ben too young, but I love the idea of putting pyjamas, a small treat a book and a film together for them to enjoy. Stew is working nights this year, so it’ll be just the three of us at home and I’d like to just snuggle up on the settee watching a Christmas film together. Our eldest boy has asked for NInjago toys for Christmas (which I think he’s too young for but he won’t be persuaded otherwise), and our youngest is obsessed with the Disney film Cars at the moment. So these pyjamas from H&M were perfect for their boxes. We then popped into Poundland and picked up a couple of boxes of Milkybar Christmas chocolates. With a book each from Homesense we’re nearly done! At Poundland we also picked up a pack of glitter to use as our elf’s magic dust, a set of animal dominoes as a stocking filler and two mini nutcracker baubles for the tree. So there you have it … our Christmas dash at Fforestfach! We were there for just over three hours, and spent a grand total of £177, which has ticked off a fair few things from our Christmas shopping list. Oh, and if you start to flag from all the shopping action, there’s a Costa and Cafe Nero for a little pick-me-up along the way! Fforestfach Retail Parc is running a competition through December, giving the chance to win £50 each week. Visit their Facebook page for details. You can also find shopping inspiration and offers on Twitter as well as their website. Happy shopping! Where is Fforestfach Retail Parc? The retail park is just off the A483 at Fforestfach. What shops are at Fforestfach Retail Parc? Homesense, EE, New Look, H&M, River Island, Boots, Poundland, DW, Cafe Nero and Costa. How long can I park at Fforestfach Retail Parc? You can park for four hours for free.